Good Tuesday Tutorial morning to you. This is Lisa. Feels like it has been forever since my last tutorial. Remember I said Trudy and I will be showing you tips and ideas for using CDS digital images? Well I'm here with another project. 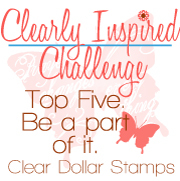 And you get a sneak peek as well at a Digital Image that will be in the CDS store this Friday February 3rd just in time for our CLEARLY INSPIRED CHALLENGE. You get to see it first. How fun is that! First thing we are going to do is arrange our digital image in Microsoft Publisher (that is what I am using). For instructions on downloading a digital image just go to my last tutorial HERE. Don't be intimidated by my instructions...I am just thorough. Go step by step to learn. You'll do great! If you don't need these instructions just skip to the pictures below. Step One: Open Microsoft Publisher...select blank page....click on Letter (Portrait) 8 1/2 x 11. Select file, then page set up then change margins to zero. Step Two: Place a text box on your page. You will see a menu on the left side of your screen...select the box under the arrow at the top that has an A and lines. Now you make it the size you want....which is 5 1/2 x 2 1/2. Plus add a 1/2" margin on the left and bottom (because when printed anything within 1/4" from the edges will get cut off) So start your text box 1/2" from the left side and bottom. This allows for a tiny overhang if you have one. You just click and drag the dots to do this using the ruler on the top and bottom of your screen.To Move your box you just click on the lines in between the dots and drag to the place you want. Step Three:Now to insert your digital image that you already downloaded. Note: I use a PC with Windows 7. My tool boxes may be different than yours. Click on "insert" on your tool bar, then "picture" then "from file". Now locate your file, open and select one purple PNG flower and click on insert. Just hover over your flower before selecting it and you will see it say JPG or PNG. Now do the same thing...this time selecting a pink PNG flower. Step Four: Move your flowers off to the side of your text box. Pull one corner so your box your flower is in is about 2 x 2. Now right click on your purple 2 x 2 flower and click on copy. Right click again and click paste. Do this again so you have 2x2 purple flowers. Arrange your flowers like I did on my card or as you like. Place all three purple flowers at the bottom of your text box in a horizontal row. Step Five: Now make your pink flower 2 x 2 and repeat the last steps to make a second pink 2 x 2 flower. Put your two pink flowers nestled in the back between the purple flowers. The middle purple flower will be in the front. The two pink flowers will be behind it and in front of the other two purple flowers. You change the order of the flowers by right clicking on your flower and selecting order then choose "bring forward" or "send to back". Print out your flowers onto COTTONBALL WHITE CARDSTOCK. Cut around your flowers leaving a thin border so your flowers are about 5 1/2" from one end to the other. (The idea is for your flowers to hang over the edge of your card a bit so you can adjust your card base to fit the size your flowers end up being). Cut an 8 1/2 x 5" piece of COTTONBALL WHITE CARDSTOCK. Score at 4 1/4 along the long side using your SCOR-PAL. Fold in half using scoring tool to crease! Cut a piece of WORN PARCHMENT 2 x 5. Now run your piece through your embossing machine ( I use my Cuttlebug) using the Cuttlebug Distressed Stripes Embossing Folder (or one that looks like wood). Use REMOVEABLE TAPE on the back and place on card front. You just want to hold it in place while measuring and cutting....not permanently. Using a ruler and pencil at the bottom of your card measure 1" in from the edge on both sides. Then draw a line from that mark to the top of the worn parchment panel's edge on both sides. Cut off both sides using your paper trimmer. Remove your embossed panel and rub off or peel off the remaining removeble tape. Run adhesive on the backside using your SCOTCH ADVANCED TAPE GLIDER. Adhere your embossed bottom panel to your card front then punch the top corner with a small round corner punch. Adhere dimensional tape to the back of your Digital Flower Image Cut Out. Another varioation using wooden buttons for the flowers' centers. In this variation I placed each flower separately then cut out with a small border. Each is popped up using an additional dimensional for each layer. The centers have corduroy brads. THANK YOU FOR JOINING ME TODAY. SEE YOU NEXT TIME. Happy Tuesday fellow crafters! It's Cassie here to bring you a sweet little tutorial to get you ready for Valentine's Day! Cut a piece of Berry Blast cardstock to be 3 1/4" X 4" and then score that piece at 3/4", 2", and 2 3/4" as shown above. Flip the piece, and then score it at 3/4" and 2 1/2" as shown above. Notice the white lines that are marked off above. . .you will but cutting on those lines. This is what you'll have when you're done cutting. Now fold on the scored lines as shown. Using the Scor-tape, assemble the box. Using your Tabs & Tags Die, cut out two tabs from the Berry Blast cardstock. Emboss your pieces using the Heart Blocks embossign folder, or whatever folder you wish. I didn't get a picture of it, but I ran my Bubble Gum ink over the top of my pieces to really make the hearts pop. Then, I used my Scor-tape on the top and the bottom of the box . Using about 10" of Lime Juice twine, I attached it to the box as shown above. Using the Tabs & Tags Die, I cut out one piece from the Kiwi Delight cardstock. Stamp your sentiment from the Sweet Heart set onto the piece using the Spring Leaf ink. Stamp the 'hugs & kisses' circle sentiment with Bubble Gum ink onto Cottonball White cardstock. Punch out your sentiment using a 1 1/4" circle punch. This blank space in the middle of the piece can be used to write the recipient's name. Assemble your box and put your piece of candy inside. Of course my box has the ever loved Heath bar in it. . .mmmmmm. Then tie your bow, and taaa daaa, you have a darling mini treat holder! These little boxes are so cute and easy to make. If you have any questions, email me (cassandratrask@yahoo.com). I'd be happy to help!